=== Version 1.4.1 === - Fix incorrect time on live tile in daylight saving timezone. === Version 1.4.0 === - Support changing profile information and password inside the app. - Fix issue of registering with large profile picture. Do you ever forget to… - Remind your husband to pick up your kid after work? - Remind your child to take medicine after lunch? - Remind your friend to bring some documents tomorrow? Let Task Me set reminder for your friend. You just need to CREATE a task, SET reminder and SEND to your friend. Then Task Me will remind your friend when the time comes. 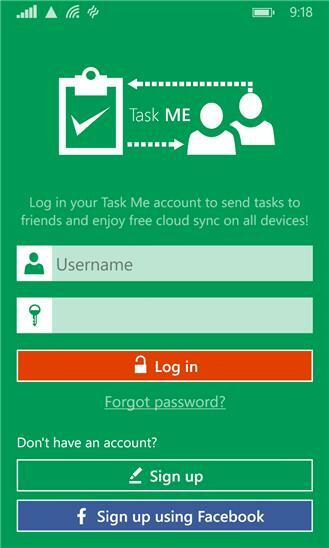 Not only sending tasks to your friend, Task Me can also manage your own tasks. Your tasks are synchronized to our cloud server and will be shared to all of your devices. In addition, more advanced features will be available in the near future, including adding tags, multiple occurrences, location awareness, voice, also send task to a group of friends. Task Me for Windows 8.1 will also be available in the near future. Stay tuned! Task Me is created to ease your burden of remembering not only what you need to do, but also what your friends need to do. We hope that Task Me will be very useful for you. === Version 1.4.1 === - Fix incorrect time on live tile in daylight saving timezone. === Version 1.4.0 === - Support changing profile information and password inside the app. - Fix issue of registering with large profile picture. === Version 1.3.4 === - Fix issue of pointing to the wrong api. === Version 1.3.3 === - Log in using email address. - Add the content of new tag box as a new tag when a task is saved. - Change display date format on the date picker. === Version 1.3.1 & 1.3.2 === - Fix crashes when showing error messages during login and registration. - Fix minor bugs. === Version 1.3.0 === - Overhaul the UI of task details and task editor - Support choosing reminder date using a calendar. - Merge messages of the same task in conversation page. - Show tag suggestions. - Several UI improvements for welcome page. - Fix crashes when tasks is deleted while synchronizing. - Fix crashes when phone storage is full. === Version 1.2.0 === - Allow adding sub-tasks to a task (Premium feature). - Allow adding tags to a task. - Allow entering task description by using speech recognition. - Change timing display to be more user friendly. - Improve login and register page - Fix crashes when going back to conversations from other apps. - Fix crashes when tapping on a reminder and then updating/deleting the task. - Fix rare crashes when registering push notifications. - Fix invalid token when activating new account. === Version 1.1.0 === - Allow adding email address and phone number to tasks. 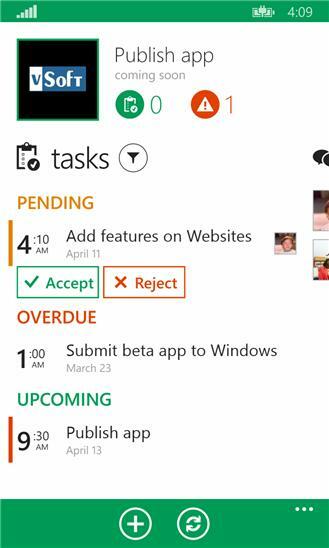 - Live tile showing next task and number of tasks left today (need Internet connection). - Show 'Mark as completed' buttons for all owned tasks. === Version 1.0.1 & 1.0.2 & 1.0.3 === - Fix minor bug when changing settings. - Fix some bugs when getting profile details from Facebook. - Various minor bug fixes.